Over the holidays we all want to take time to celebrate, reflect and stay in touch with the people we love. It’s been 25 years since the first text message was sent, sparking a revolution in how we keep in touch with each other, and we’ve come a long way since then. The art of conversation has evolved, and we’re no longer limited by just text. Just think about it, now you can group video chat with masks, choose from thousands of emojis or GIFs to add more color to your messages, and immediately capture and share photos, even when you’re already in a conversation. At Messenger, we know that every message matters and we’re focused on helping people say what they want to say, however they want to say it. Through GIFs, videos, group conversations or group video chats, Messenger gives people the freedom to connect in the way that is most relevant to them — expressive, humorous, visual, heartfelt or simply convenient. By understanding how people are messaging today, we can continue to make Messenger the best place to connect with the people you care about most. 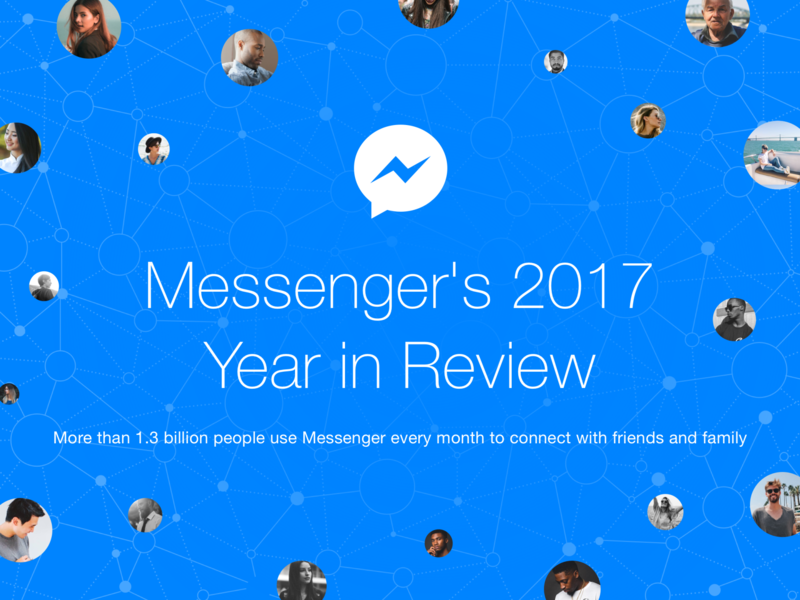 We’re excited to look back over the year, and highlight the top ways we saw Messenger’s 1.3 billion strong global community connect and share with each other in 2017. Video chat took a leap forward. Chatting face-to-face is perfect for those spontaneous moments when text just isn’t enough. We heard from people that they wanted more than just one-to-one video chats, which is why we launched group video chat about a year ago. The experience is the same whether you’re on Android or iOS — and we introduced a few new Augmented Reality features – like masks, filters and reactions – in June to make your video chats more fun and expressive. Overall, there were 17 billion realtime video chats on Messenger, marking two times as many video chat sessions in 2017 compared to 2016. People video chatted across each other all around the world — including Antarctica! We can only imagine how awesome it was to share a moment in front of icebergs and penguins with friends and family back home. Visual messaging brings our conversations to life. We’re connecting more than ever. We believe in the power of messaging to make meaningful connections. While some cultural pundits would argue that messaging makes us isolated, what we’ve found is that messaging actually brings us closer together. On average, there are over 7 billion conversations taking place on Messenger every day in 2017. At the same time, on average, 260 million new conversation threads were started every day in 2017. The holidays are popular times to connect with each other online as well as offline. New Years, Mother’s Day, and Valentine’s Day were three of the top five most active days for chats on Messenger. And it’s all about the power of groups. The average group chat includes 10 people. We offer people on Messenger fun ways to customize their group chats. The most popular custom emoji is the red heart, and the most popular custom chat color is red. As the year comes to a close, we want to extend a big thank you to our Messenger community – we are so happy to be part of your every day lives and we can’t wait to help you chat longer, play games, take great photos or message a business in 2018! Thank you for trusting us with your messages that matter.